Hi, Good Morning, Thanks to all friends and viewers. 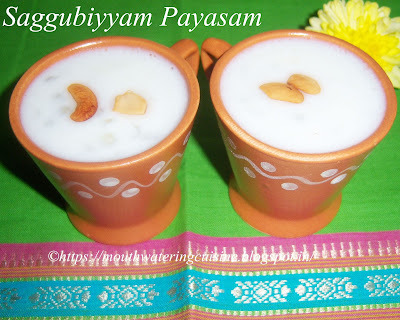 Today I will post how to make saggubiyyam Payasam or Sago Payasam. It is very simple and easy. We make this when somebody in the house feels sick or not feeling well due to stomach upset. But we do not add milk, cardamom powder and cashew nuts to it at that time. Just boil the sago in water till done and add sugar to it. This will boost the energy levels very fast. We use this during summers to beat the heat and also to keep the body cool. To enrich the taste add little salt and buttermilk to the boiled sago. The best and quick way of making sweet during any festive season. It is also very traditional sweet in most of the households. Some people add semiya to it, to make it more flavourful. But I do not like it. I like both of them separately, but not the combo. We can make different varieties with sago also like vada, kichdi, upma and of course vadiyalu or fryums. Saggubiyyam Payasam -- made with Sago or Saggubiyyam, milk and sugar. Soak sago in water for half an hour to one hour. Soaking is done to cook them faster, but it can be avoided. If using semiya, heat ghee in a kadai, fry it till golden brown and keep it aside. In a thick bottomed vessel cook the sago and semiya(if using) in low flame while stirring ocassionally till they are done. The sago grains and semiya also turns translucent once done. Add milk to it and allow this to boil for another 10 minutes. The payasam should be in pouring consistency. Add sugar and mix it well. If it is becoming thick add milk to it. Fry them till the cashew nuts turn light brown. Add them to the above payasam. Switch off the flame and transfer it to serving bowl. Serve hot/cool saggubiyyam payasam anytime.